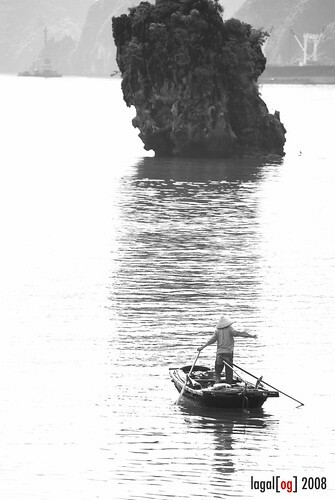 Halong Bay is beautiful, replete with karsts and bucolic scenes like the fisherman in the capture, though one can't help but notice the cranes and metal structures in the near distance. Seems development is coming to the bay but not without marring the beautiful land and seascape. seeing those metal structures makes it look more like subic bay without the islets of halong. true, dom, how true. i couldn't agree more. medyo pampasira nga ng view, if you'd ask me. milie, it was smooth sailing after the squall from the port right up to the next day when we took the trip down halong bay. really a nice time to sail.